Whether you’re a hands-on programmer or business decision maker, a desktop software expert or ‘born in the cloud’, we’ve got lots of cool stuff for you at Forge DevCon –the kind of stuff you can’t get by sitting behind your desk: including keynotes, roadmaps, customer case studies, technical deepdives, panel sessions, networking opportunities, one-on-one technical support and advice, and hands-on exhibits. Just come to Forge DevCon on Monday to attend the keynotes and some core classes. Even better – Forge DevCon and the Connect & Construct Summit are collaborating this year, so if you buy a ticket for one of them you can attend any part of either conference. We’ve staggered the keynote sessions so that you can attend both, and we’ll have a combined networking/expo hall. At the Forge DevCon keynotes, you’ll hear from Sam Ramji, Autodesk’s new Vice President for Cloud Platforms and Brian Roepke, Senior Director for Forge Product Management about their plans for the future of the Forge platform; and you’ll hear from early adopters of some of the new Forge APIs. Make sure you check in on the more detailed Forge Roadmap classes too. Forge DevCon offers a large syllabus of classes. On Monday, we have 25 classes – 5 parallel streams of 5 sessions each. We’re also frontloading the AU Software Developer Track with Forge content by scheduling 11 Forge classes on Tuesday to make Forge DevCon a two-day learning experience. In addition to these classes, Forge is featured in many other classes scattered around the Autodesk University schedule (search for Product=Forge on the AU schedule to find them all). Class types vary from Case Studies, to technical deepdives, to panel discussions, to strategy and roadmap presentations, so there really is something for everyone. AEC – Topics specific to the Architecture, Engineering and Construction industries. Design & Manufacturing – Topics specific to the specific to the Design & Manufacturing industries. Forge Basics – Roadmaps and strategy, cross industry topics, and topics related to our current Forge APIs. Forge Futures – We’re announcing a lot of new APIs at Forge DevCon, including the much anticipated Design Automation APIs for Revit and Inventor, and our new Data Platform and Services (formerly known as AppFramework) APIs. So we’ve created a whole track of classes dedicated to them: starting with a high level overview, and then drilling down into increasing technical detail. Complementary Technologies – The most innovative solutions combine Forge APIs with other technologies and APIs; such as machine learning, IoT, Mixed Reality, and Robotics. Find out more about how these technologies, and how customers and partners are using them with Forge. General Programming – Classes to make you a better web programmer: everything you wanted to know about web security; how to incorporate testing into your software development processes; why more and more web developers are moving to node.js; how to architect your web applications; and how to apply your desktop skills to web programming. Classes are great for learning, but sometimes you have a very specific problem you’d like help with or you want specific advice on how Forge can help you solve a business problem. 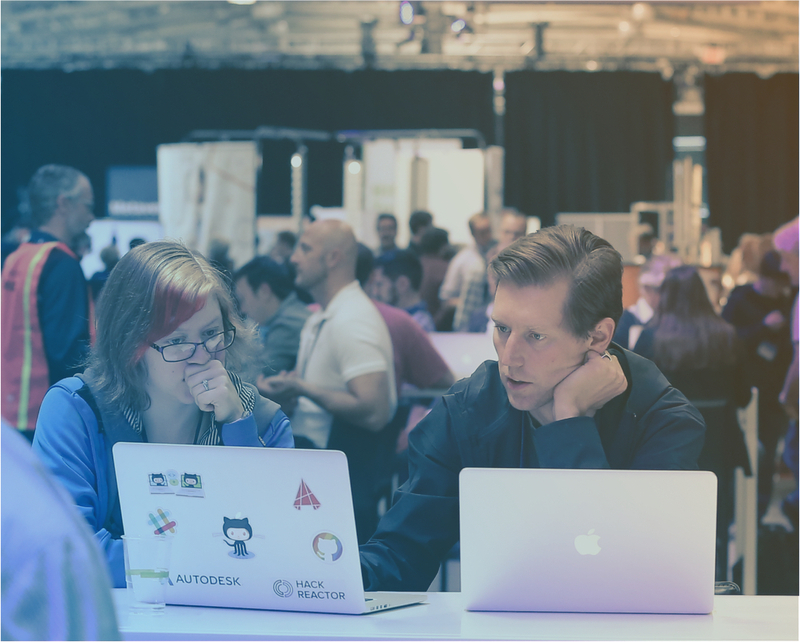 We’re giving you plenty of opportunities at Forge DevCon and AU to spend quality time with Forge experts – both business and technical. Answer Bars – We’ll have dedicated Forge Answer Bars in the Forge DevCon/Connect & Construct networking area and in the AU Expo Hall that will be staffed the entire time those areas are open. Come and ask a quick question or sit down in a quiet corner for a long discussion. Forge DevLab – Forge DevLab is an informal, drop-in workshop for programmers. It’s a big room with lots of tables where you can spend some quiet time working to solve a problem with Forge API experts from the Autodesk DevTech team standing at your shoulder. DevLab is open on Tuesday between 1.30pm and 5.30pm, but you can drop in at any time and stay for as long as you like. You can get advice on architecting your Forge application, work through a self-guided Forge tutorial, or just get a guided tour of the Forge learning resources available to you. [And members of the Forge team will be wearing something that makes them stand out in the crowd so that you can easily find them. Last year we dressed them as Easter chicks, the year before as construction workers. Let us know if you have suggestions for this year :-)]. The Forge DevCon/Connect & Construct networking ‘Village’ and Expo Hall will be open all day on Monday, and will become the heart of the Autodesk University Welcome Party in the evening. Talk to the exhibitors about what they’re doing with Forge; meet some of our Forge Systems Integrators and University teams; watch some lightning presentations in the Theater; visit the Mixed Reality zone; play with some hands-on Forge-based experiential exhibits; or just chat to a few fellow attendees to find out what you have in common. This has really been covered already by reasons #3 to #4. Classes, keynotes, exhibits, answer bars – just wander around and see some of the amazing applications and workflows that Autodesk customers and partners are creating with Forge. You can’t fail to be inspired! If so, don’t wait – Register Today for Forge DevCon Las Vegas. (And we know that Forge DevCon is the most important Autodesk conference, but don’t forget to register for Autodesk University too :-)). Although Forge DevCon at Las Vegas is by far our largest Forge conference, there will be a Forge presence at other Autodesk events. Most of our regional Autodesk Universities will feature a Forge booth and a few Forge classes. And, in Europe, we have a dedicated Forge DevCon conference in Darmstadt, Germany on October 16th (the day before AU Germany).